LIV Sotheby’s International Realty (LIV SIR) brokers Mckinze Casey and Garrett Beserra present a rare opportunity to be at the center of the new 9th & Colorado redevelopment district – a highly anticipated urban infill project sited on 26-acres and spanning 12-city-blocks. The project anticipates 300,000-square-feet of retail, as well as a number of parks, plazas, and open space. Across the street from the Colorado redevelopment district, at 8th & Bellaire sits Bellaire 6, a luxury townhome project. Yet to be released to the market and near Denver’s highly coveted Cherry Creek neighborhood, the project already has two units already under contract. The three-bedroom, three-full-and-one-half-bathroom townhomes start in the mid $600s. All units offer universal floorplans boasting over 2,300-square-feet, with clean and upscale finishes, four outdoor areas including rooftop decks with rare privacy walls and shaded overhangs for year-round usability, private master bedroom decks, massive two-car garages for storing all your gear, plus rare-to-the-price-point, three-bedroom layouts that are ideal for hosting guests. 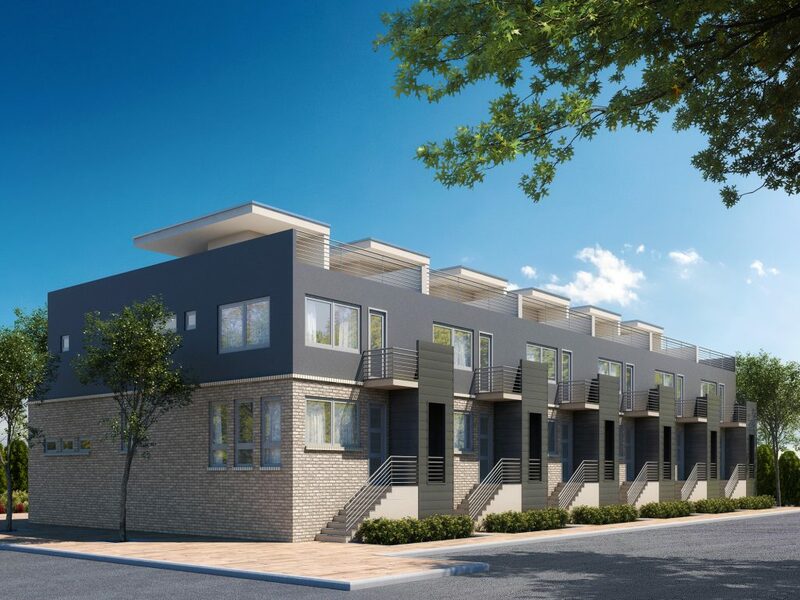 The developer has poured an incredible amount of detail into these select townhomes and identification of this specific location – which is precisely across the street from the 9th & Colorado redevelopment district – is going to create a neighborhood that many will want to call home. “Currently, many neighborhood residents frequently need to cross Colorado Boulevard to enjoy Cherry Creek. The redevelopment district will give area residents an option to enjoy their own neighborhood with shops, restaurants, and entertainment right outside their front door,” says Casey. The townhomes are situated just a half block from the incredibly popular Trader Joe’s, also with close proximity to 9th & Colorado’s 10-screen AMC Theatre, Hopdoddy Burger Bar, Postino Wine Café, Snooze, and Chase Bank. The bright and airy floor plans include a lower level guest suite, main level living and dining, and a generous master with spa-like bath, and private second story balcony. “Right now, buyers can choose from a few remaining customization options for their new home before completion in late August,” adds co-lister Garrett Beserra. LIV SIR brokers Casey and Beserra are also listing 989 Leyden Street, a luxury new construction residence located near the Bellaire 6 development in the Montclair neighborhood. The six-bedroom, five-bath, single-family home was listed last week for $1.495 million and went under contract its first day to market. Casey says due to the location, the home received substantial interest from buyers looking for new construction of this size and price point. The developer has more single and multi-family projects planned in the area. For more information contact LIV Sotheby’s International Realty brokers Mckinze Casey 480.220.8597, Garrett Beserra at 720.560.9312, or visit www.Bellaire6.com. To list your home for sale with LIV Sotheby’s International Realty, please visit www.livsothebysrealty.com or call 303.893.3200.